It’s like Dirty Dancing, without the dirty. 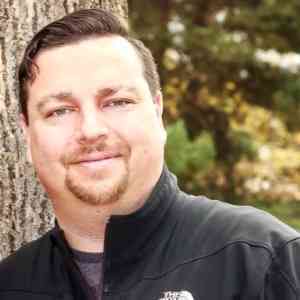 Busting into a club, gravitating towards unsuspecting victims, activating your groove, and encouraging them to join your dance line. 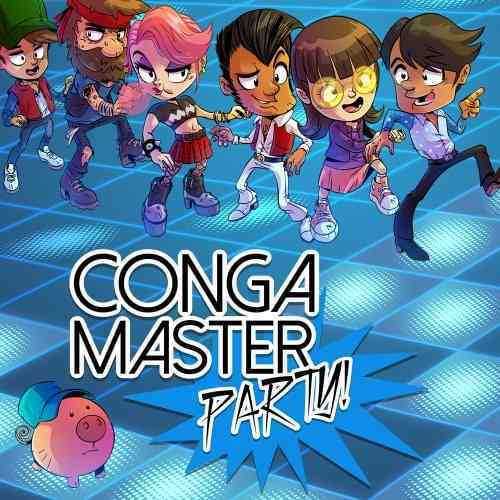 It’s not something that always works in the real world (trust me, I’ve tried), but in Conga Master Party! you are the dance commander and your mission is clear – get everyone dancing. Utilizing a nostalgic art style and a boatload of pop-culture references – this is one game that even gamers cursed with two left feet will groove to! Conga Master Party! follows the story of a dancer (you’ll get to pick who from a list of characters that will grow as you unlock more). This dancer starts their night off in one club, shaking their booty around the dance floor, eventually attracting a growing line of dancers to their conga line. The goal for our dancer is to meet the necessary criteria to advance to the next location – eventually dancing in eight locations (okay, there are actually nine locations, but shh! one’s a secret – but it’s definitely the cat’s meow!). Once you enter a club, you’ll notice four different meters on the left-hand side of the screen – each with a different icon. 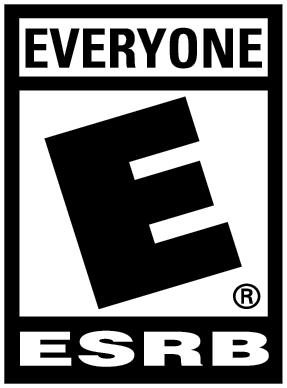 Each of the four icons represents a different type of character within the level. In order to complete a level, you’ll need to create a conga line with a specific amount of each of the four different character types. You’ll also notice a “Momentum” meter on the bottom of the screen. When your momentum runs out, it’s game over. To build up your momentum, you’ll need to attract more people. To attract people, you’ll need to dance around them until their personal attraction meter fills up and they join your conga line. You’ll also come across power-ups that will assist you along the way. Pigs (yes, those pre-bacon animals) will try to get into your conga line, but this will actually hurt your momentum (don’t ask me why). The entire game is played with just the left and right bumpers or triggers (aside form a post-level mini-game) – incredibly simple, but definitely effective. Visually, the game utilizes that ever-popular pixelated look from games of yesteryear. In Conga Master Party!, I felt this art style was a perfect fit. However, there were times when the game would become noticeably slow, which was a bit surprising. This slowdown really didn’t hinder my ability to play, just a minor annoyance. The levels each have a unique theme; such as a casino and a burger joint. Each level is filled with pop-culture references – so much so that I found myself noticing a bunch of “new” things the second time I played through the game. I won’t spoil the references here, but it’s safe to say most gamers will be able to point out a bunch of different characters and references unless they’ve been living under a rock for the past few decades. 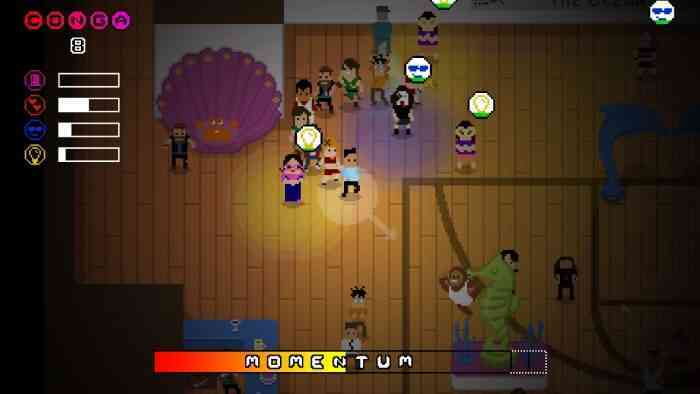 Beyond the games single player mode and an “endless mode” that lets players just pick a level and play for as long as they can go; Conga Master Party! also, provides a local multiplayer mode. I got a kick out of the various multiplayer mode titles, as they’re all a reference to popular video games (such as Grand Theft Auto, Command & Conquer, and Cut-the-Cord). Most of the modes allow for four local players, but there are a few two-player only modes. Each mode has a slightly different theme to it, such as the Cut-the-Conga mode that drops “scissors” power-ups onto the field that allows players to cut their opponents conga lines. Conga Master Party! surprisingly features amiibo support, which definitely got me excited, but the end result was a bit disappointing. You can unlock 12 costumes for 12 specific characters with amiibo, but the costumes are not Nintendo character related. And since the game doesn’t specify which amiibo actually work, it was trial and error figuring out which amiibo worked (the different Mario variants, Legend of Zelda, and Splatoon amiibo worked for me – but none of my other amiibo worked). It’s great to see any game support amiibo, but in this case, it felt more like a way for them to add “amiibo support” to the games list of features. Conga Master Party! is a blast to play. It’s simple but challenging in such an addicting way. During my first playthrough, I failed a lot – but kept coming back for more. Once I completed the game, I started it back up right away which in itself is a testament to how great it really is. I doubt I’ll get much mileage from the multiplayer component (I played each of the modes with my son – we had a few laughs, but that’s about it). It’s not an overly long game, but it’s still a fun little time waster that reminds me of that classic game “Snake” (or like the kids are playing these days, Slither.io). This is definitely a fun little gem that is I can happily recommend!